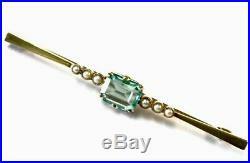 BEAUTIFUL 15CT GOLD BROOCH SET WITH AN AQUAMARINE EMERALD CUT STONE & THREE HALF SEED PEARLS ON EACH SIDE. 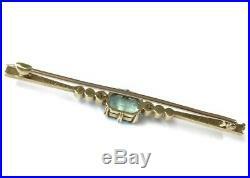 THE BROOCH MEASURES APPROX 57MM LONG. 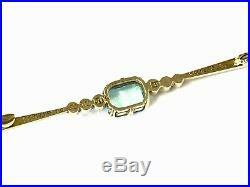 THE GREEN COLOURED AQUAMARINE STONE MEASURES APPROX 8X7MM & HAS AN INCLUSION IN THE CENTRE. STAMPED 15 FOR 15CT GOLD & SS MAKERS MARK. INSCRIBED - MOTHER TO ELSIE XMAS 1924. GOOD CONDITION - WILL BE POLISHED PRIOR TO DISPATCH. WILL COME IN NEW CARD GIFT BOX. 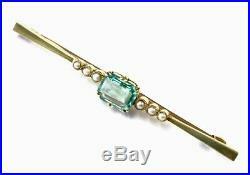 The item "ANTIQUE Vintage 15ct Gold Aquamarine Pearl Brooch Pin MOTHER TO ELSIE XMAS 1924" is in sale since Saturday, December 8, 2018. This item is in the category "Jewellery & Watches\Vintage & Antique Jewellery\Vintage Fine Jewellery\Art Deco (1915-1935)". The seller is "ningsthings" and is located in Sutherland. This item can be shipped worldwide.